This is a bird's eye view of most of our property. We are fortunate to have mostly open land. The open fields in back have been kept as pasture or hayfield for decades, and will hopefully serve that purpose for us as well. Here is a close up of the core of the homestead. 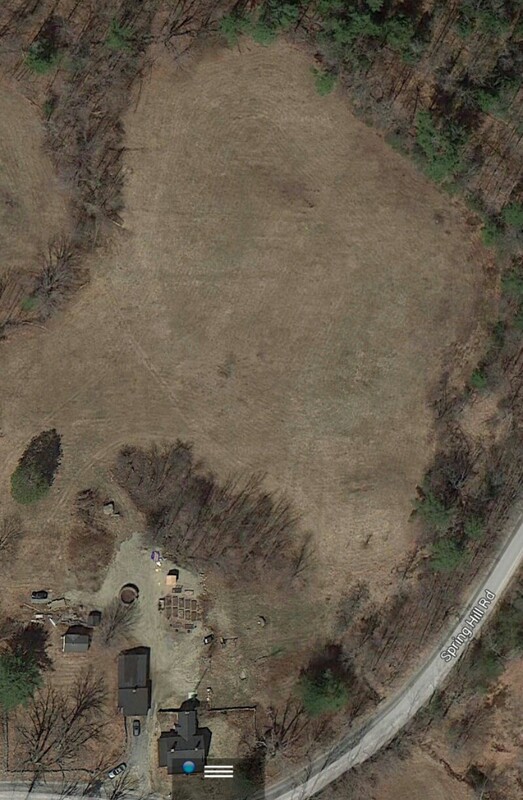 While this doesnt give you a sense of the slope of the land, it does outline the main features. The house is center bottom of the photo, with the old garage and shed to the left and slightly above. Directly behind the shed is the stone foundation of the old silo. It is rather in the way now, but almost impossible to knock down. Those stone walls are 2 feet thick and 6 feet high. We keep trying to come up with a creative idea for its use. Can you think of something? Where the small chicken coop stands now used to be 40x80 foot grand barn. Sigh, I do wish it was still here. You can see the forms of the raised garden beds, which I have already dismantled (we are using that wood to burn for boiling the sap). There is also a small building we call "the white house" which we havent decided on a use for as yet. Mostly, this overview helps me to see sun and shade patterns. It also helps me to see zones of activity, so we can plan the best location for things like the greenhouse, and fencing and gates. The photo was taken probably close to this time of year, (I am guessing early April) so the shade patterns help me to see where areas of sun should be in the later spring and summer, for garden planning. I ask the question, "once those large oaks in the bottom left leaf out, how much shade will they cast on the hillside there?" Will it be sunny enough to plant the new apple trees? It seems that there is going to be a great deal of shade.. maybe too much for the apples. 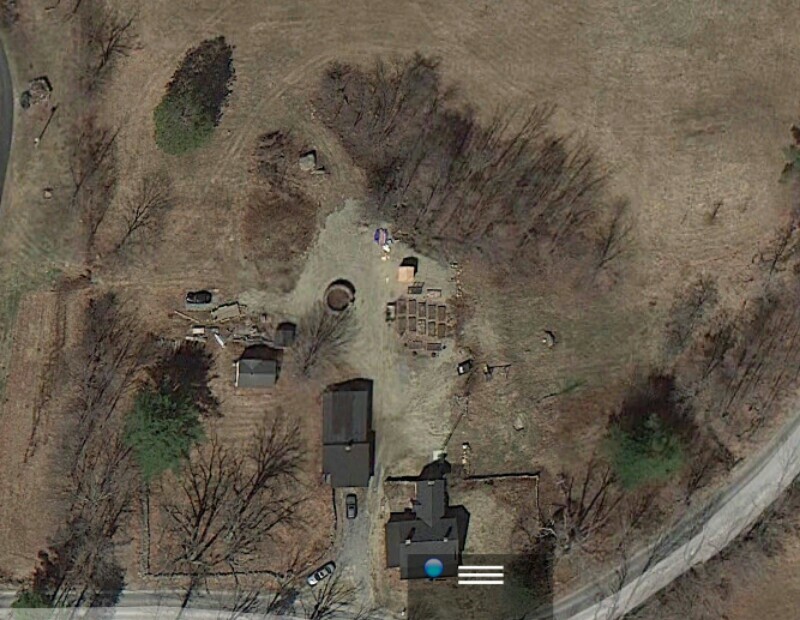 Maybe a better location for the garden would be behind the white house, where it should still get mostly full sun, and it wont be so likely to interfere with paddocks and driveway patterns when the new barn is built. To some extent, this is the time to make big changes, like moving the garden, since we plan to tear down the garage and barn and rebuild. On the other hand, our resources are limited, and we may need to work with whats here.